최근 온라인 금융서비스의 성장과 금융 기술의 급격한 발전으로 인하여 온라인에서 사용자를 등록 및 인증하기 위한 비대면 본인확인 기술에 대한 다양한 접근 방법의 필요성이 제기되고 있다. 일반적으로 비대면 방식은 대면방식에 비해서 많은 위협에 노출되어 있다. 따라서 최근에는 이런 위험성을 보완하고 보다 신뢰할 수 있는 비대면 본인확인 방법을 위해서 다양한 요소와 채널을 이용하여 사용자를 검증할 수 있는 정책과 기술이 연구되고 있다. 이러한 새로운 접근방법 중 하나는 다수의 사용자 개인정보를 수집하고 검증하는 기술이다. 따라서 본 논문은 사용자의 다양하고 많은 정보를 기반으로 온라인에서 본인확인을 수행하는 빅데이터 기반 비대면 본인확인 방법을 제안한다. 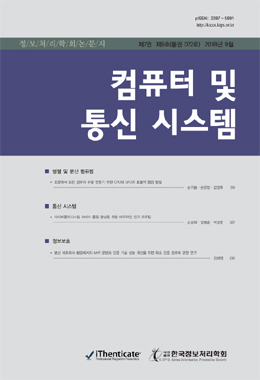 또한 제안방법은 서비스에서 요구하는 본인확인 등급에 필요한 사용자 정보만 수집하고 검증하는 세분화된 본인확인 정보관리 방법을 제안한다. 그리고 본 논문은 검증된 본인확인 정보를 사용자가 재사용할 수 있도록 다른 서비스 제공자들과 공유할 수 있는 본인확인 정보공유 모델을 제안한다. 마지막으로 제안 방법이 비대면 본인확인 과정에서 강화된 사용자 검증을 통해서 서비스에서 요구하는 본인확인 등급만 검증하고 관리하는 시스템을 구현하여 실험 결과를 분석한다. The need for various approaches to non-face-to-face identification technology for registering and authenticating users online is being required because of the growth of online financial services and the rapid development of financial technology. In general, non-face-to-face approaches can be exposed to a greater number of threats than face-to-face approaches. Therefore, identification policies and technologies to verify users by using various factors and channels are being studied in order to complement the risks and to be more reliable non-face-to-face identification methods. One of these new approaches is to collect and verify a large number of personal information of user. Therefore, we propose a big-data based non-face-to-face Identity Proofing method that verifies identity on online based on various and large amount of information of user. The proposed method also provides an identification information management scheme that collects and verifies only the user information required for the identity verification level required by the service. In addition, we propose an identity information sharing model that can provide the information to other service providers so that user can reuse verified identity information. Finally, we prove by implementing a system that verifies and manages only the identity assurance level required by the service through the enhanced user verification in the non-face-to-face identity proofing process.